From the snowy expanse of the Winterbole Forest to the sun-warmed coasts of ancient Vailin, four great powers struggle for survival. A spectacular game of strategic empire-building in the vein of classic like Risk and the old GameMaster games. Featuring 252 plastic pieces of troops, monsters and heroes, you can even send fighters and wizards into dungeons scattered across the lands to fight guardians and obtain treasure, while your armies battle over the land above. Muster armies of footsoldiers, siege engines, monsters, and dragons to attack your enemies. Fight across the waves with fleets of warships and raging elementals. 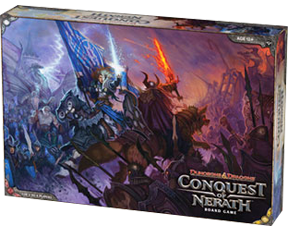 I enjoy playing more complex and similarly-themed games like Runewars, but this fantasy conquest game with the D&D brand is a nice throwback to the days when the rules were simple and the box was chock-full of plastic miniatures. Aug 2011 1.1 Changed reference sheets to match the size of the ones in the game—turn sequence one side, unit stats on the other.